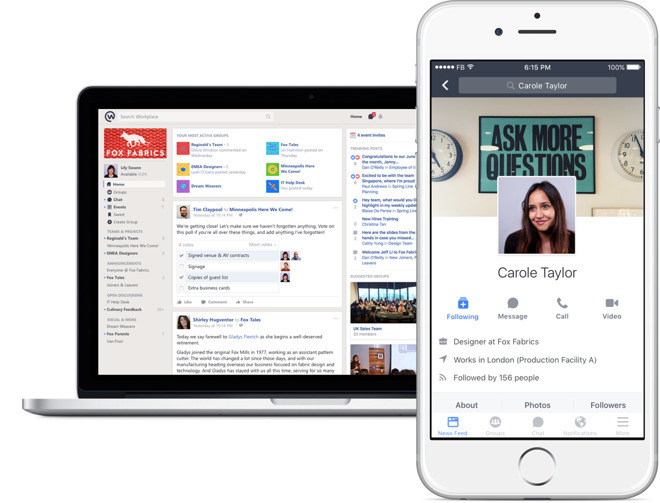 Facebook on Monday officially introduced Workplace, a long-in-testing collaboration tool for businesses and other organizations, aimed at challenging similar offerings from the likes of Slack. Facebook's service includes not just chats, but custom profiles and ad-free News Feeds separate from the main Facebook site. People can also create multi-organization groups, make audio and video calls, and/or start live video broadcasts. To keep Workplace competitive, Facebook is charging $3 per month, per user for organizations with up to 1,000 people —and scaling that to as low as $1 per user for organizations with over 10,000 people. It's completely free for non-profits and schools. Facebook could still face an uphill battle against Slack, which while charging $6.67 per person under its Standard plan, offers a Free tier that costs absolutely nothing within some limitations, like smaller search and file archives. Significantly, Workplace has a more restricted integration library. Accompanying the service's Web interface are apps for iOS and Android. These offer many of the same features as the Web interface in a format similar to the core Facebook mobile apps.